Today I made my first salad with fresh moringa leaves. My young Moringa / Malunggay / Sajina / Murungai seedlings, which are sitting in a corner of my house with full light, was growing very quickly and some of them became bigger than 50 cm, so I pinch the terminal growing tip ~10 cm from the top. Secondary branches began appearing on the main stem since one week ago and hope to grow vigorously in next weeks. 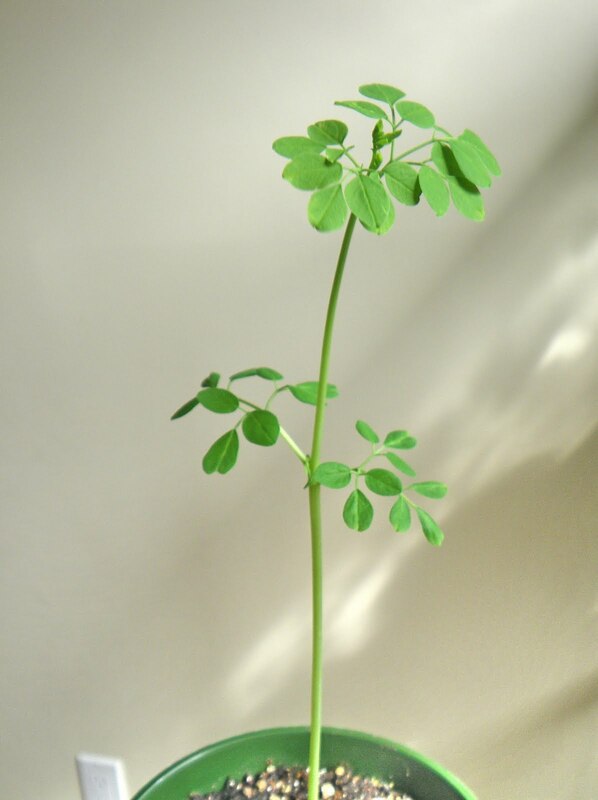 Maybe soon my Moringa trees will become bushy and will begin to look like a little bonsai tree. I added Moringa leaves in mixed veggies salad with red lettuce, sprouts, tomatoes, mild baby pepper, sunflower seeds, green onion, dill and olive oil. The taste of leaves - similar to spinach but somehow different. I like their spicy taste and horseradish flavor. People tend to eat the same foods they grew up with, resisting new foods and dishes, but are hundreds of unique foods available in other corners of world that would add to the diversity of our diet. How I am curious by nature, I like to discover other ethnic foods and enjoy totally a variety taste of dishes from different cultures. 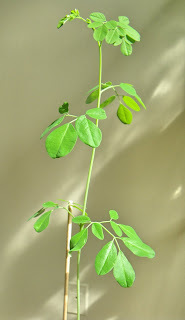 Grow, moringa tree, grow quickly! I am from the Philippines and Moringa or malungay as we commonly call it was always part of our menu. When I breastfed our babies, I cooked lots of chicken or fish tinola, shellfish all with moringa leaves. Like you, it was only recently that I discovered how amazing moringa is. Now I drink fresh moringa tea, eat the blanched leaves as topping to tuna sandwich and more.. I am looking Moringa for weight management. It is very important to do a researchon Moringabefore using it. Your blog familiar me with many other benefits of Moringa. Thanks!!! any updates on your Moringa? I'm not very familiar with how to search for entries, but I hadn't come across an update yet....curious for sure. best of luck. Unfortunately we've lost them in winter. sorry to hear it. Are you planning on getting some more seeds and trying again? I haven't tested mine in Winter yet, but our's isn't too bad here in Texas. I figure I'll keep them in the greenhouse a bit longer. they're not super happy, definitely looking forward to Spring. looking forward to updates. Yes, for sure Mark, we love Moringa. Looking forward to keeping up on any new ones you start. I need to take some new photos of mine, but they're adapting nicely to the warmer weather. I've repotted a lot of them, still have plenty more to do. Have a Happy Birthday, Canada!